Definition at line 52 of file eyefinder.cc. References DEFAULT_CENTERING, DEFAULT_PATCH_REZ, and initROIdata(). Definition at line 56 of file eyefinder.cc. References leftROIdata, ROIdata::Release(), releaseStream(), and rightROIdata. Definition at line 254 of file eyefinder.cc. 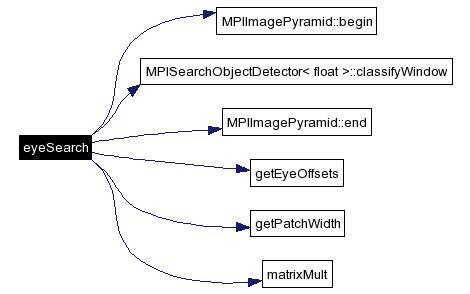 References average, MPIImagePyramid::begin(), MPISearchObjectDetector< float >::classifyWindow(), MPISearchStream::corners, MPIImagePyramid::end(), MPISearchStream::fns, getEyeOffsets(), getPatchWidth(), GPrior::invCov, leftROIdata, m_centering, m_rez, matrixMult(), GPrior::mean, ROIdata::mean, MPISearchStream::mpi, MPISEARCH_OBJECT_TYPE, none, MPISearchStream::norm_window, MPISearchStream::nw_c, MPISearchStream::nw_fn, FeatureData::patch_width, wt_avg, wt_max, VisualObject::x, xoff, VisualObject::xSize, VisualObject::y, y, yoff, and VisualObject::ySize. 00292       // check the window. If it passes, cascade_level will be 1. Otherwise, it will be  <= 0. Definition at line 208 of file eyefinder.cc. References ObjectList::begin(), ObjectList::clear(), VisualObject::clear(), ObjectList::end(), eyeSearch(), f(), FaceBoxList, faces, left_eye_data, left_eye_stream, lefteye, FaceObject::leftEyes, FaceObject::posterior(), VisualObject::push_front(), right_eye_data, right_eye_stream, righteye, FaceObject::rightEyes, MPISearchObjectDetector< float >::search(), setROI(), ObjectList::simplify(), VisualObject::size(), and ObjectList::size(). Referenced by MPBlink::findBlinks(), and mexFunction(). Definition at line 387 of file eyefinder.cc. References eye_centered, eye_dist, eye_only, face_centered, half_dist, largest, largest_2, smallest, xoff, and yoff. Referenced by eyeSearch(), and setROI(). Definition at line 370 of file eyefinder.cc. References eye_dist, eye_only, half_dist, largest, largest_2, and smallest. Definition at line 88 of file eyefinder.cc. References ROIdata::bounds, ROIdata::cov, i, ROIdata::invCov, leftROIdata, ROIdata::mean, ROIdata::numscales, rightROIdata, ROIdata::scales, and v.
Reimplemented from MPISearchObjectDetector< float >. Definition at line 66 of file eyefinder.cc. References MPISearchStream::init(), left_eye_data, left_eye_stream, right_eye_data, and right_eye_stream. Definition at line 441 of file eyefinder.cc. Definition at line 424 of file eyefinder.cc. Definition at line 81 of file eyefinder.cc. References left_eye_stream, MPISearchStream::release(), and right_eye_stream. Referenced by resetStream(), MPBlink::~MPBlink(), and ~MPEyeFinder(). Definition at line 74 of file eyefinder.cc. References MPISearchStream::init(), left_eye_data, left_eye_stream, releaseStream(), right_eye_data, and right_eye_stream. Definition at line 63 of file eyefinder.cc. Referenced by righteye_smallest_eye_centered::assignData(), righteye_largest_face_centered::assignData(), righteye_largest_eye_centered::assignData(), righteye_largest_2_eye_centered::assignData(), righteye_half_dist_eye_centered::assignData(), righteye_eye_only_eye_centered::assignData(), righteye_eye_dist_face_centered::assignData(), righteye_eye_dist_eye_centered::assignData(), lefteye_smallest_eye_centered::assignData(), lefteye_largest_face_centered::assignData(), lefteye_largest_eye_centered::assignData(), lefteye_largest_2_eye_centered::assignData(), lefteye_half_dist_eye_centered::assignData(), lefteye_eye_only_eye_centered::assignData(), lefteye_eye_dist_face_centered::assignData(), and lefteye_eye_dist_eye_centered::assignData(). Definition at line 64 of file eyefinder.cc. Definition at line 137 of file eyefinder.cc. 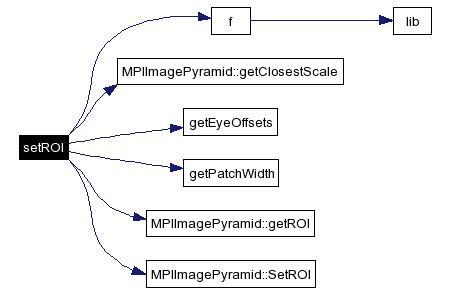 References d, f(), MPIImagePyramid::getClosestScale(), getEyeOffsets(), getPatchWidth(), MPIImagePyramid::getROI(), i, left_eye_stream, lefteye, m_centering, MPISearchStream::m_data, m_rez, max, MPISearchStream::mpi, FeatureData::patch_width, right_eye_stream, righteye, MPIImagePyramid::SetROI(), ROI::vmax_x, ROI::vmax_y, ROI::vmin_x, ROI::vmin_y, VisualObject::x, xoff, VisualObject::xSize, VisualObject::y, yoff, and VisualObject::ySize. Definition at line 93 of file eyefinder.h. Referenced by findEyes(), initStream(), and resetStream(). Definition at line 94 of file eyefinder.h. Referenced by findEyes(), initStream(), releaseStream(), resetStream(), and setROI(). Definition at line 95 of file eyefinder.h. 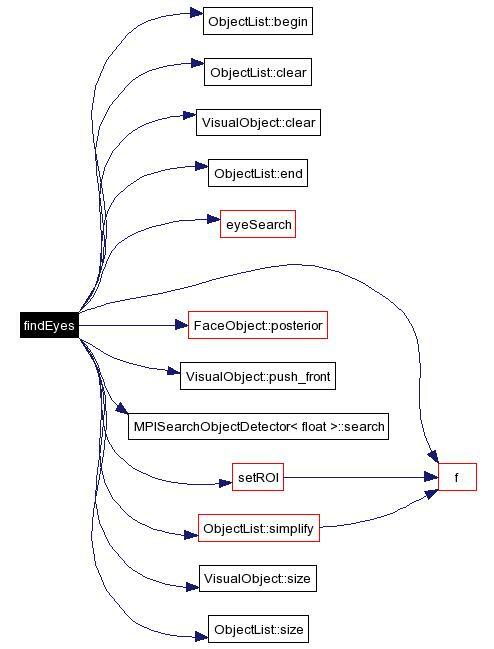 Referenced by eyeSearch(), initROIdata(), and ~MPEyeFinder(). Definition at line 90 of file eyefinder.h. Referenced by eyeSearch(), SetCentering(), and setROI(). Definition at line 89 of file eyefinder.h. Referenced by eyeSearch(), SetRez(), and setROI(). Definition at line 91 of file eyefinder.h. Definition at line 97 of file eyefinder.h. Definition at line 98 of file eyefinder.h. Definition at line 99 of file eyefinder.h. Referenced by initROIdata(), and ~MPEyeFinder().